Indiana Governor Eric Holcomb is a Republican. In Indiana, that puts him fairly in the majority, but when it comes to transgender issues, he’s in the minority. As the state prepares to bicker over a hate crimes law again, Holcomb has announced he wants to be sure it includes protections for trans people. Republicans have killed similar bills previously because it included transgender people. Republican House Speaker Brian Bosma, one of the legislature’s most vociferously anti-LGBTQ politicians, opposes the inclusion. Bosma, who has touted himself as a “family values” hero despite numerous allegations of marital infidelity, is a darling of the local religious right. Holcomb, who was Lt Governor under Mike Pence, is well aware of the black eye Pence gave the state with his “religious freedom” law that allowed businesses to refuse to serve LGBTQ customers. So are business and tourism leaders. The Indy Chamber of Commerce, Visit Indy, Eli Lilly, the Pacers have all urged the legislature to pass the inclusive bill. Businesses, tourism officials, Democrats and civil rights activists banded together after the religious freedom debacle to get the law overturned. 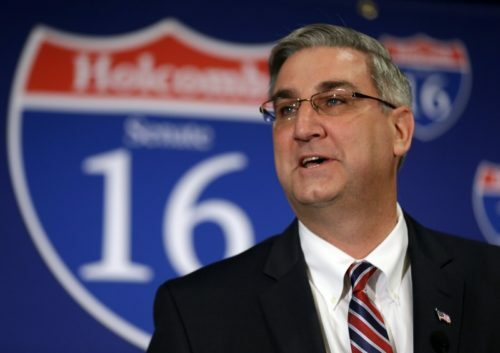 Holcomb has said he wants the hate crime law to mirror the executive branch’s nondiscrimination policy – which includes both sexual orientation and gender identity. Indiana does not have a nondiscrimination law that protects residents who aren’t employed by state government. Now Bosma is warning business leaders and activists not to push too hard to get transgender people included because it would bring “undue attention to our state” now that Indiana is known as one of the state’s most unfriendly to LGBTQ people. “The result of this and how the discussion takes place affects every Hoosier and if this is a big knock down, drag out, RFRA-esque discussion, it is not going to help anyone, and everybody is going to go to their corner and stand firm,” Bosma told the Indianapolis Star. The idea of simply protecting everyone – as most residents and business leaders want – without making a big deal of it apparently hasn’t occurred to Bosma. He would be leading the charge against inclusion, thus causing the outcry. Indiana is one of only five states without a hate crimes law. Opposition to including LGBTQ people has always stopped numerous attempts to pass it. Earlier this year, Republicans wanted to strip transgender people from a similar bill but Holcomb told them to either include gender identity or don’t pass anything at all. Legislators chose not to bring it up for a committee vote rather than protect transgender people. Republican state senator Ron Alting is a co-sponsor of the hate crimes bill and after a year chock-full of hate crimes in the state, he thinks he has enough support among Republicans to get the bill passed. Republicans control both chambers of the state legislature.